This interesting flavor combination of white wine, onions, grapes, and feta cheese was a definite winner. This was also extremely easy and quick to make, and leftovers held up quite well (with the exception of some violet-stained pasta). The "sauce" (which is really more of a reduced stock) smelled amazing during cooking, especially after adding the wine to cook off. Fresh thyme was added, although I could barely taste it (half a teaspoon of fresh herbs is hardly enough), and would suggest maybe using something more prominent like rosemary. Roasting grapes was also a first for me. I imagined they wouldn't quite turn into raisins, but more wrinkly and flavorful, sort of like sun-dried tomatoes. The grapes remained juicy, with a nice olive oil flavor (and a little salt too). 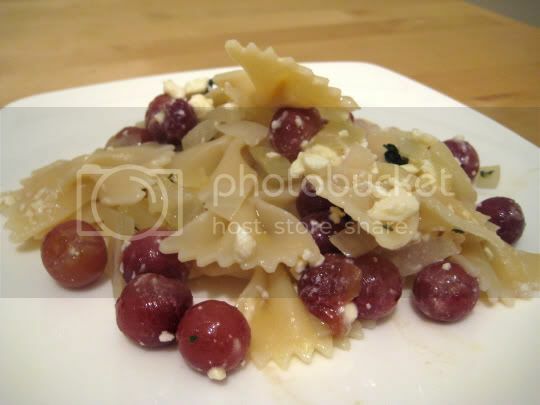 The juiciness and sweetness of the grapes was a wonderful match with the salty feta, and the wine sauce helped flavor the pasta with a nice savory taste. I think the recipe calls for a little too many onions, but nonetheless, they add a nice crunch to the dish. Every bite is complete with sweet, salty, savory goodness that makes you look forward to the next one. Make again? Definitely. Experimenting with grape varieties, wines, and cheeses would be fun too.